Through our vision and values we hope to achieve our core purpose to 'inspire confident, resilient learners who will thrive throughout their lives'. 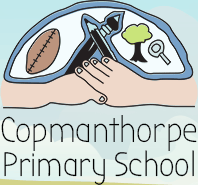 We aspire for Copmanthorpe Primary School to be a place where everyone has a growth mind-set, aims high, and can over come barriers to success. Through the opportunities we provide, in partnership with parents and carers, we aim to develop children as independent, resilient learners and effective communicators. We want our children to develop a life-long love of learning to enable them to achieve and succeed in the future. Trusting and caring for everyone makes our school a safe place to be. We think positively: we are all full of hope for today and for our futures. We welcome care for and respect everyone. We grow our intelligence and skills by having a growth mindset. Friendship is really important to us. We persevere and never give up! We show our creativity in everything we do. We value resilience so if something gets in our way we can always bounce back. Inspiring and exciting learning opportunities allow us to thrive. We develop independent learning, thinking and life skills. We believe that education is a partnership between teachers, parents/carers, children and the wider community. Clear communication between these parties will ensure that we all understand the intentions and beliefs of others. We hope that our policy of openness and co-operation will contribute to making your child’s time at Copmanthorpe both happy and successful. If you would like to find out more, please arrange to come and see the school in action. We would be delighted to meet you and feel sure you would enjoy your visit. "I like this school because we have ‘Family Groups’ where we do fun things with children from different years." "The teachers are great because they teach me new things and help me read and write."